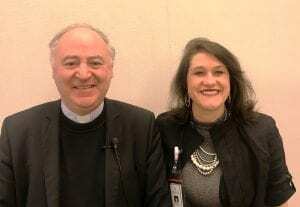 Our 11th Annual Lecture Series, presented by St. Joseph’s/Candler Foundations featured Monsignor Renzo Pegoraro, physician, author, bioethicist and Chancellor of the Pontifical Academy for Life at The Vatican. He was joined by ethicist Dr. Kathleen Deloach Benton, our newly appointed President and CEO. In addition to St. Joseph’s/Candler Foundations, other 2019 sponsors included the Endowment Fund of the Georgia Medical Society, Meyer & Sayers, LLP, and Costrini Critical Healthcare Decisions. The Annual Lecture Series strives to engage medical and clinical leaders, health and social service professionals, and the public at large in meaningful conversations around end of life issues. Prior speakers have included Dr. Angelo Volandes and Dr. Ira Byock.